Want to try an alternative to the traditional wedding guest book? Wishing Tree Cards are a wonderful alternative or supplement to the traditional guest book. It allows your wedding guests to convey their well wishes to the bride and groom AND allows you to turn those wishes into a keepsake for years to come. 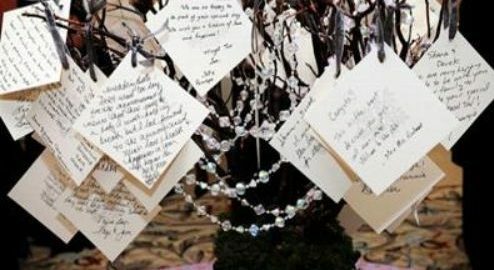 Everyone knows the guest book but there is a new alternative, called a Wishing Tree, which has slowly been creeping its way into more and more weddings. Guests not only sign their name to a card, but they also have space to add their best wishes to the new bride and groom. Then they can hang the card on the tree. At the end of the reception, the tree is fully adorned with well wishes from family and friends! Once the reception is over, the cards are gathered together, ribbons removed and bound back together and placed in the case. Take the cards on your honeymoon and read them to each other! Open them and reminisce at your first anniversary and every year after!